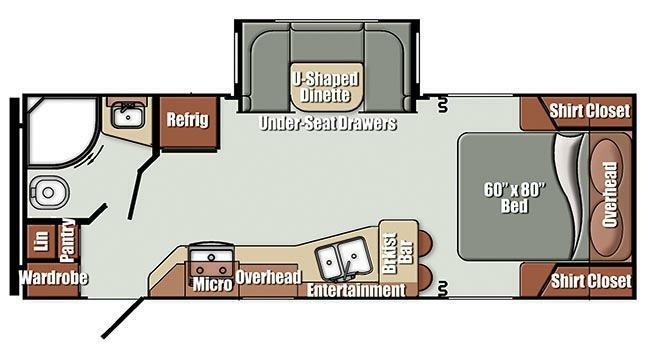 Young's RV Center in Fremont, Ohio wants YOU to become a HAPPY CAMPER in this ALL NEW 2018 Gulf Stream GEO 235RB Travel Trailer! GEO is the Newest, Freshest offering from Gulf Stream Coach with an Exciting New Blend of Leading-Edge Design and Extraordinary Value. The GEO reflects the Style and Innovation seen in today's homes and hotels. It is Solidly Built, Well-Equipped, Stylishly Designed, and Easy to Tow. The GEO 235RB has an Interior set off by Clean, Contemporary Lines and an Upscale Color Palette. As you Enter this GEO 235RB to your Right you will find Storage Galore! There is a Wardrobe with Drawers Below and a Large Pantry to tuck away your dry goods or dinnerware. Straight ahead is the Fully Equipped Rear Bath which includes a Sink with Medicine Cabinet, Toilet, Tub/Shower, Power Vent, Skylight, and Linen Cabinet for storage. The location of the Bathroom makes "potty breaks" quick and simple and also cuts down on the amount of dirt tracked throughout your Unit. Next you will find the Combination Kitchen/Living Area which boasts a Large U-Dinette Slide-Out with Underseat Drawers. You can kick back and relax at this Dinette and enjoy your favorite music on the Home Theater Stereo with Bluetooth or watch a movie on your LED TV. And if your Adventures leave you hungry, don't worry, the GEO 235RB Kitchen has everything you need to REFUEL. This Door-Side Kitchen Area features Solid-Surface Counters with an "Infinity" edge, Stainless Steel Kitchen Faucet with Pull-Out Sprayer, 3-Burner Range with Glass Range Cover and Oven, Microwave, 6 CU FT Double Door Refrigerator, Decorative Stove Top Backsplash, Energy Efficient LED Lights, and Handcrafted Cabinets. And if you want to grab a quick breakfast before hitting the lake, you can do so at the convenient Breakfast Bar off the far end of the Kitchen Counter. And finally, your Rear Bedroom awaits you. You will be tempted into sleeping in through the morning on your Comfy 60 x 80" Bed with Premium Foam Mattress. Ample Storage space is provided with Dual Mirrored Bedside Shirt Closets and Nightstands below. The Overhead Shelf comes in handy for storing books, music, or nick-knacks. With Exterior Features such as its Laminated Construction and a Molded Fiberglass Cap with LED Accent Lights, the GEO offers a whole New Way to Enjoy the Great Outdoors! So get the Whole Family Packed up and come on over to Young's RV Center. Young's has been in Business for over 70 Years and has grown to be one of the Oldest RV Dealerships in the State of Ohio. We are conveniently located between Toledo and Cleveland, near Sandusky's Cedar Point, Columbus, and the North Coast of Lake Erie. We are Here to Assist You with ALL of Your RV Needs! Call or Visit Us Today! Copyright © 2019 Youngs RV. All rights reserved. While we attempt to ensure display of current and accurate data, this listing may not reflect the most recent transactions or may reflect occasional data entry errors. All inventory listed is subject to availability and prior sale. Please consult dealership personnel for details. Photographs may be representative only and may vary somewhat from the actual items offered for sale.